The glass blowing industry of Venice is well-known from the 8th century. 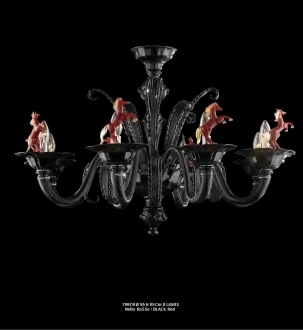 The Roman occupation, the contact with the Byzantine art and connection w ith various countries in the East made Venetian glass artists experts in the field. Thus glass art thrived in the main land of Venice till the 13th century and then threatened by the high temperature kilns of the glass furnaces, the whole industry was shifted lock, stock and barrel to the island of Murano, whic h is sufficiently away from the mainland. Isolated from the rest of the world by a highly restrictive law, the glass blowing guild began to concentrate on their skills and through constant experimentation, evolved quite a few innovative techniques that contributed greatly to the glass art of the world. Sommerso glass was one of those techniques that produced glass articles which were and still continues to be breathtakingly beautiful. The technique involves an authentic knowledge about various color combinations. It also involves an extremely high level of dexterity in glass blowing and layering. The word meaning ‘Sommerso’ means ‘submerged’ or ‘sunken. This means the Sommerso art involves submerging a blown article in crystal clear molte n glass of a different color. 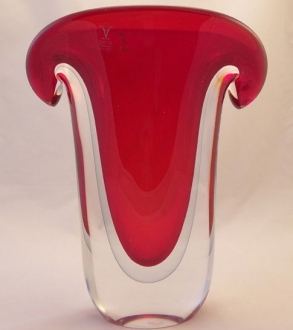 This technique was involved in Murano in 1930 by Carlo Scarpa. 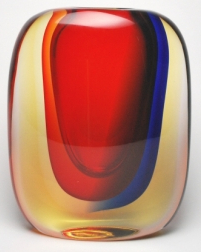 The Sommerso technique and glass were given a further lease of life in 1950 by Seguso d’Arte. 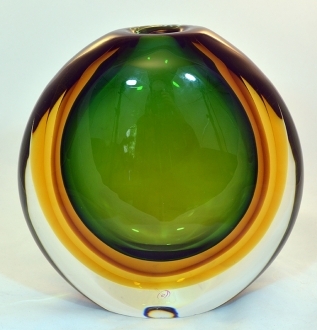 The maestro blows an inner core and then this is dipped in a pot containing transparent molten glass of another color. 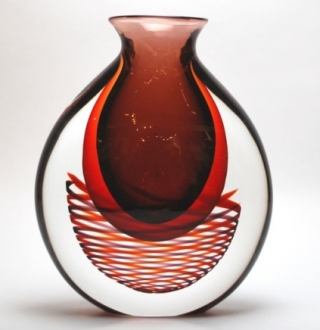 Sommerso glass artists began by making vases, ashtrays, bowls etc. with two overlapping colors. But soon they began to make articles with a number of layers which blend seamlessly into each other. This superimposing of transparent colored glass produces a magnificent chromatic effect. Many layers of glass usually make the articles rather heavy and hence acquire complete stability in their housing. Initially the layers used were clear and transparent. But later bubble glass and gold leaf glass also were used for various layers, enhancing the appearance of the glass further. Now multi-colored glass rods are also used for an outer layer which gives the article an exquisitely striped look. The Sommerso glass articles made using the ancient and traditional glass technique are considered to be must-have things in a collector’s cache. 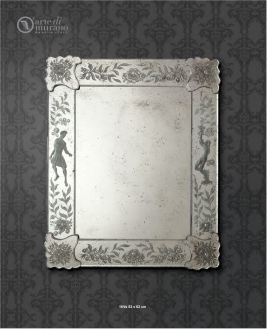 Their extremely simple but beautiful appearance appeals to art lovers all over the world. Besides, they are splendid gift articles which are valued worldwide. Height: 62 cm" Length: 52 cm"